Tomlin’s return from Tommy John surgery is certainly impressive, but his mediocre skill set has not changed. In fact, Tomlin is 24-19 with a 4.86 ERA and 1.22 WHIP in 55 career Major League starts, including garnering an awful 6.36 ERA and 1.46 WHIP in 2012. Let’s also note that Tomlin is 1-2 with a career 4.38 ERA and 1.09 WHIP versus the Indians, including allowing a combined eight earned runs on 17 hits in his last two trips to Tampa Bay (13.7 innings pitched). Tomlin is also hampered by a scuffling Cleveland offense that is batting .240 with a .315 on base percentage this season (4.1 runs per game), including hitting .221 with a .300 on base percentage on the road (3.7 runs per game) and .236 with a .317 on base percentage in day games (4.1 runs per game). Meanwhile, Tampa Bay starter Chris Archer has been struggling recently as evidenced by his 6.89 ERA and 1.59 WHIP over his last three starts. However, Archer has always been more comfortable at home where he was 5-3 with a 3.03 ERA and 1.01 WHIP in 2013. 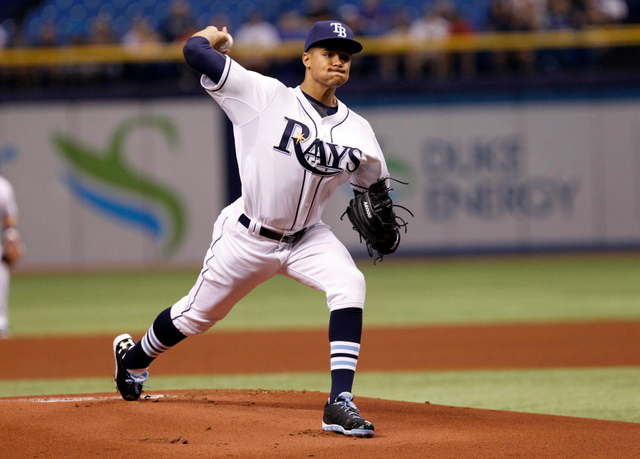 Archer has continued his success at home this season where he is a perfect 2-0 with a 3.06 ERA and 0.96 WHIP. Afternoon starts also seem to get the best effort from Archer as he was 4-2 with a 2.73 ERA and 1.10 WHIP in ten day starts last season. With Cleveland standing at 40-72 (-22.6 units) as road underdogs of +150 or less, take the Rays and invest with confidence. Analysis: Seattle is one of the hottest teams in baseball as the Mariners have won ten of their last 13 games, including last night’s a 3-1 victory over the Royals behind another surprising outing from Chris Young. Seattle sends southpaw Roenis Elias to the mound this afternoon against a Kansas City squad that owns a woeful .231/.296/.310 batting line versus left-handed pitchers. Moreover, the best hitters in Kansas City’s lineup – lefties Eric Hosmer and Alex Gordon – will be neutralized by Elias. I also like the fact that Elias is supported by a defense that ranks seventh in the Majors in defensive efficiency. Elias is 3-2 with a 3.27 ERA and 1.30 WHIP this season and toes the rubber in excellent form as evidenced by his 3.32 ERA and 1.26 WHIP over his last three starts. Elias is also supported by an outstanding Seattle bullpen that owns a 2.97 ERA and 1.42 WHIP at home and a 0.00 ERA and 1.06 WHIP over the last seven games. Meanwhile, Kansas City starter Jeremy Guthrie is 2-7 with a career 4.90 ERA and 1.26 WHIP versus the Mariners. More importantly, Guthrie has yielded a combined 17 earned runs on 25 hits in his last 17.3 innings pitched against Seattle, a period covering three starts. From a technical standpoint, Kansas City is 11-27 (-19.6 units) in the month of May over the last two seasons, while the Mariners are 30-10 (+19.0 units) as small home favorites of -125 or less. With Seattle standing at 12-6 in this series over the last three seasons, including 8-2 at home, take the Mariners and invest with confidence.